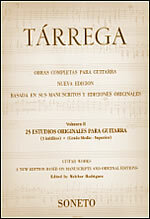 These 25 ORIGINAL STUDIES for guitar by F. Tárrega complete, along with the 30 elementary ones included in Volume 1, the pedagogical part of the didactic studies Tárrega composed for the guitar. These works, like the previous ones, were written as classes for his disciples, and have the same technicalmusical purpose, being elaborated with the concrete aim of overcoming the characteristic difficulties of the guitar. They produce fine results; since the guitarist studying them will progress greatly on h is way to becoming a professional virtuoso of the guitar. Sor, Villalobos and other composers who complement Tárrega are also essential to any guitar study programme.